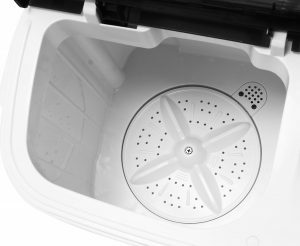 Think Gizmos TG23 is the latest model twin tub compact and portable washing machine, that includes a convenient wash and spin cycle compartments. It scores 4.25/5 stars out of 9 customer ratings on the day of this review, which is a good indication of its quality and functionality. The TG23 has a robust build that makes it durable and should last you a long time if not used very roughly. You’ll find two tubs in this washer, one of which is for washing and the other for spinning. And the total capacity is 3.6kg or 8 pounds for washing and 2kg for spinning, which is quite all right for a compact and lightweight washing machine. It may be ideal if you live on a boat or have a caravan or go camping and will be away for a while with clothes to be cleaned. This easy to assemble and use washer doesn’t need any plumbing, but just an access to water and draining. You can get the washer run for up to a quarter of an hour and five minutes in the spin dry cycle. You can choose from either the normal wash or soft wash options. It is a little more work than the larger full automatic machines but is still rather easy to use. You first put your clothes in, then the water and washing powder or liquid and turn the washer on. When the washing cycle is completed, move your clothes to the spinning section to dry your clothes a little, to make them ready for hanging. White and black Think Gizmos TG23-USA weighs 28 pounds and measures 27 x 23.7 x 15 inches. It is especially good for those with a limited space in their flat or caravan, that lack adequate space for a large washing machine. You can relocate and store it away easily too. 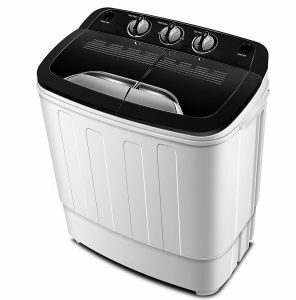 Both the washing and the spinning compartments have separate timers and you also have the different modes of washing. You can expect a similar washing and spin drying performance to the larger washing machines. The difference is you will be doing a little more work, but not much and you’ll be able to wash less amount of clothes at once. This one obviously costs much less than even the cheapest of larger machines so it will save you money as it is also rather economical to run. It will also save you space and time because it washes your clothes in a shorter time. You will get everything you need for the machine to run in the box: The washing machine, water fill hose and the operating manual in five languages- English, Italian, French, Spanish, and German. You have three easy to use control dials on top of the machine. It runs quieter than regular- large automatic machines because of its efficient and quiet motor. This is a good quality washer that is claimed to clean and remove stains better than normal washing machines, using much less detergent and making less noise. Spinner section works very well too and gets all the water out of your clothes. You’ll fill it with water from the tap with the water filling hose you’ll get in the box. And it can take some effort to drain the water and clean it after you’re done with washing. But it is certainly a lot less effort than going to a laundromat and wait for it to wash and dry your clothes. You can get a bit of shaking but that is when the machine is just starting to run and about to end the cycle. You will need it higher off the ground as the drainer works by gravity. If you’re buying it for saving money purposes, this machine will pay for itself in no time. It is offered with a year of warranty by the manufacturer in case you run into any problems.